Alegría Fresh, an unusual farm that grows its produce in vertical structures, turned to an old fashioned method to reach retail customers. 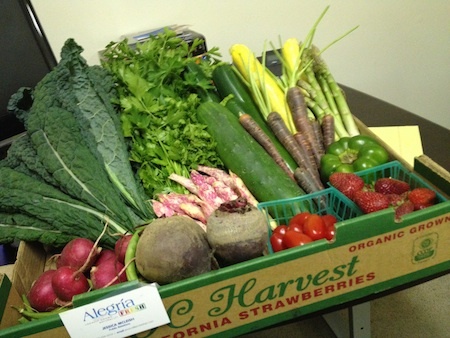 In partnership with Orange County Produce, LLC, Alegria last week began offering weekly home delivery of its fresh organic bounty. Erik Cutter, Alegria’s managing director, hopes to nurture interest in urban farming with the hydroponic system, which uses 90 percent less water, 70 percent less land and 50 percent less fertilizer, according to their website. In an attempt to spread healthy eating habits and urban agriculture awareness, Cutter offers training in the hydroponic method. Though similar to a CSA, or community-supported agriculture, Alegría is a bit different. Alegría relies on a range of individuals, from interns to regular employees to volunteers, who sell their produce only to those who subscribe to their box delivery program or request a one-time order. Algeria’s partners, A.G. and Matthew Kawamura, manage Orange County Produce, which oversees the farming of over 800 acres. A.G. Kawamura, the state’s former agriculture secretary, currently co-chairs Solutions From the Land, a Lutherville, Md., initiative to develop sustainable agricultural practices, while ­­­­­Matt Kawamura is a third-generation strawberry grower and long-time member of the Southern California agricultural community. Under both, the Orange County Produce team fights local malnutrition and hunger while informing locals about the benefits of alternative farming methods. The partners are currently working on an exhibit focusing on urban farming and its future in Irvine’s Great Park. But the real stars of the show are the boxes: delivered within 24 hours of harvesting and featuring a range of seasonal – and sometimes rare – edibles. Current offerings include green beans; cranberry beans; yellow squash; green zucchini; cucumbers; fenugreek; pea shoots; red or golden beets; purple carrots; radishes; sunflower sprouts; strawberries; blue, red or curly kale and green bell peppers. At 12-pounds or more, boxes are $35 each, including delivery, though it is limited to Laguna Beach’s city boundaries. For those outside the boundary, a pick-up can be scheduled. Luckily for those living in surrounding cities, Alegría has given in to the numerous requests it has received and will test out delivering to a broader area after Monday, July 8.